Thoracic aortic aneurysm (TAA) is a life-threatening condition that causes significant short- and long-term mortality due to rupture and dissection. Aneurysm is defined as dilatation of the aorta of greater than 150% of its normal diameter for a given segment. For the thoracic aorta, a diameter greater than 3.5 cm is generally considered dilated, whereas greater than 4.5 cm would be considered aneurysmal. Aneurysms may affect one or more segments of the thoracic aorta, including the ascending aorta, the arch, and the descending thoracic aorta. As many as 25% of patients with TAA also have an abdominal aortic aneurysm. Thoracic aortic aneurysm most commonly results from degeneration of the media of the aortic wall as well as from local hemodynamic forces. Descending thoracic aortic aneurysm with mural thrombus at the level of the left atrium. Degenerative changes in the wall of the aorta lead to cystic medial necrosis. This causes damage to collagen and elastin, loss of smooth muscle cells, and increased amounts of basophilic ground substance in the medial (elastic) layer of the aorta. The ascending thoracic aorta is generally most affected by cystic medial necrosis, whereas a descending thoracic aneurysm is primarily a consequence of atherosclerosis. In Marfan syndrome, abnormalities of the gene encoding for the synthesis of fibrillin have been implicated in the predisposition to form aneurysms. Mutations in the gene responsible for this structural lipoprotein found in the aortic wall have been found in patients who do not have Marfan syndrome but have aneurysms. As many as 75% of patients with a bicuspid aortic valve have shown evidence for cystic medial necrosis, which may be because of inadequate fibrillin production. Other inherited forms of medial degeneration have been associated with defects in the genes for fibrillin and are associated with higher rates of thoracic aortic aneurysm (TAA). Weakening of the aortic wall is compounded by increased shear stress, especially in the ascending aorta. This segment of the aorta is most exposed to the pressure of each cardiac systole (dP/dt) as well as the dynamic heart motion transmitted from each cardiac cycle. As local wall weakness causes dilatation of the aorta, wall tension increases (described by the Laplace law (T=PR), where wall tension equals the radius of a cylinder multiplied by the pressure within it). Small tears in the intimal (innermost) layer of the aorta can permit blood to penetrate the medial layer, leading to aortic dissection. Thoracic aortic aneurysm is most common among whites. Men are affected 2-4 times more frequently than women. The mean patient age at diagnosis is 60-65 years. Isselbacher EM. Thoracic and abdominal aortic aneurysms. Circulation. 2005 Feb 15. 111(6):816-28. [Medline]. Clouse WD, Hallett JW Jr, Schaff HV. Improved prognosis of thoracic aortic aneurysms: a population-based study. JAMA. 1998 Dec 9. 280(22):1926-9. [Medline]. Ince H, Nienaber CA. Etiology, pathogenesis and management of thoracic aortic aneurysm. Nat Clin Pract Cardiovasc Med. 2007 Aug. 4(8):418-27. [Medline]. Coady MA, Rizzo JA, Elefteriades JA. Developing surgical intervention criteria for thoracic aortic aneurysms. Cardiol Clin. 1999 Nov. 17(4):827-39. [Medline]. Coady MA, Rizzo JA, Goldstein LJ, Elefteriades JA. Natural history, pathogenesis, and etiology of thoracic aortic aneurysms and dissections. Cardiol Clin. 1999 Nov. 17(4):615-35; vii. [Medline]. Barbant SD, Eisenberg MJ, Schiller NB. The diagnostic value of imaging techniques for aortic dissection. Am Heart J. 1992 Aug. 124(2):541-3. [Medline]. Bickerstaff LK, Pairolero PC, Hollier LH, et al. Thoracic aortic aneurysms: a population-based study. Surgery. 1982 Dec. 92(6):1103-8. [Medline]. Crawford ES, Cohen ES. 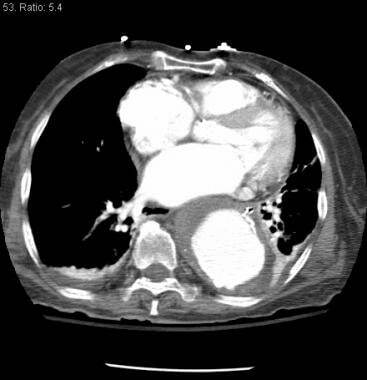 Aortic aneurysm: a multifocal disease. Presidential address. Arch Surg. 1982 Nov. 117(11):1393-400. [Medline]. Dapunt OE, Galla JD, Sadeghi AM, et al. The natural history of thoracic aortic aneurysms. J Thorac Cardiovasc Surg. 1994 May. 107(5):1323-32; discussion 1332-3. [Medline]. Fuster V, Andrews P. Medical treatment of the aorta. I. Cardiol Clin. 1999 Nov. 17(4):697-715, viii. [Medline]. Glade GJ, Vahl AC, Wisselink W, et al. Mid-term survival and costs of treatment of patients with descending thoracic aortic aneurysms; endovascular vs. open repair: a case-control study. Eur J Vasc Endovasc Surg. 2005 Jan. 29(1):28-34. [Medline]. Guo DC, Papke CL, He R, Milewicz DM. Pathogenesis of thoracic and abdominal aortic aneurysms. Ann N Y Acad Sci. 2006 Nov. 1085:339-52. [Medline]. Leurs LJ, Bell R, Degrieck Y, et al. Endovascular treatment of thoracic aortic diseases: combined experience from the EUROSTAR and United Kingdom Thoracic Endograft registries. J Vasc Surg. 2004 Oct. 40(4):670-9; discussion 679-80. [Medline]. Pressler V, McNamara JJ. Aneurysm of the thoracic aorta. Review of 260 cases. J Thorac Cardiovasc Surg. 1985 Jan. 89(1):50-4. [Medline]. Safi HJ, Miller CC. Thoracic vasculature. Townsend CM, Beauchamp DR, Evers MB, et al, eds. Sabiston Textbook of Surgery: The Biological Basis of Modern Surgical Practice. 16th ed. Philadelphia, Pa: WB Saunders Co; 2001.
von Allmen RS, Anjum A, Powell JT. Outcomes after endovascular or open repair for degenerative descending thoracic aortic aneurysm using linked hospital data. Br J Surg. 2014 Sep. 101(10):1244-51. [Medline]. Stein LH, Berger J, Tranquilli M, Elefteraides JA. Effect of statin drugs on thoracic aortic aneurysms. Am J Cardiol. 2013 Oct 15. 112(8):1240-5. [Medline]. Nation DA, Wang GJ. TEVAR: Endovascular Repair of the Thoracic Aorta. Semin Intervent Radiol. 2015 Sep. 32(3):265-71. [Medline]. Disclosure: Serve(d) as a director, officer, partner, employee, advisor, consultant or trustee for: Medical advisory board for EyeLife.<br/>Received consulting fee from Simulab for consulting.